The moment we think about South Indian food, idli, dosa and vada are the popular dishes that strikes our mind – and it’s fair enough because they are not only popular in South India but, all over the country. They can be enjoyed anytime of the day be it for breakfast, evening snacks or dinner. Freshly steamed idli with the popular coconut chutney or dry chutneys like milagai podi mixed with oil/ghee and piping hot sambhar is a staple at most households. Also, different states have different varieties of dosas to offer – like the neer dosa, benne dosa of Karnataka and pesarattu of Andhra, adai of Tamil Nadu. Served with chutneys like tomato chutney, spicy onion chutney, red garlic chutney, etc. or dry chutney powders like the malgapodi or curry leaves powder. Rice holds a special position in the South Indian kitchen. Lunch and dinner are dominated by rice and it is eaten with various curries and dal. Another, comfort food is More Chadam (DAHI CHAWAL) curd rice. That said, the final master stroke given is the zesty tempering of mustard seeds, asafetida, urad dal and curry leaves. Just like Dal Khichdi in North, Khichdi Kadhi in West, South Indian’s eat Sambar Rice also known as Sambar Sadam. One dish meals like Bisi Bele Bath, a hot and spicy rice preparation is made using rice, dal and vegetables flavoured with a special masala and tamarind pulp. Most rice preparations are served piping hot topped with lots of ghee and accompanied by fried papads and a cool raita. Each nook and corner of Southern India has a different food story to tell. Coconut oil is majorly used to cook curries and from coconut milk to freshly grated coconut or coconut based pastes, something or the other is added to make varieties of stews and curries. Locally available vegetables like pumpkin, yam, raw banana, drumsticks are abundantly used. Tamarind pulp or kokum, mustard seeds, fenugreek seeds, sesame seeds, red chillies, broken urad dal and chana dal are frequently used ingredients in South Indian cooking. They are used to make different combinations of masalas to make South Indian curries. Enjoy delicious curries like with Potato Stew, Kadala Curry or Vegetable Kurma with Appam , Idiyappam or Puttu. Steamed rice are also enjoyed with rasam and avial. Varities of Kalan, Kootu curry , errisery are enjoyed with parotta, akki roti, kallappam or uttapam. 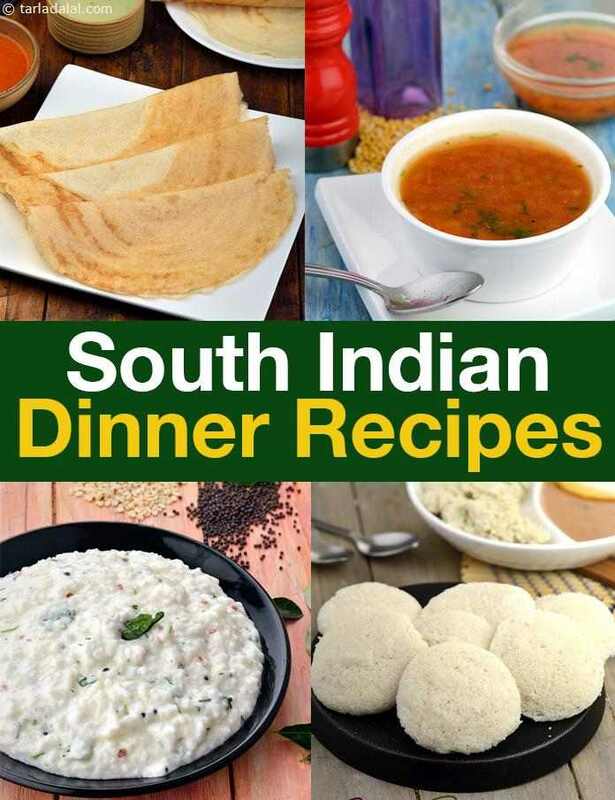 You will enjouy our collection of South Indian Dinner Recipes. Given below are interesting articles for Dinner Recipes from different parts of India.